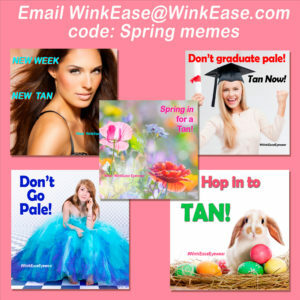 Blog | Eye Pro, Inc.
Use Social Media Tanning Memes to Increase Spring Sales! April 2019 – EYE PRO, Inc., world leader in disposable eye protection for indoor tanning and makers of Ultra Gold WINK-EASE, Lash Room WINK-EASE and WINK-EASE Dark, is offering fun tanning ads for salons to use to promote their pro-tanning presence on social media. 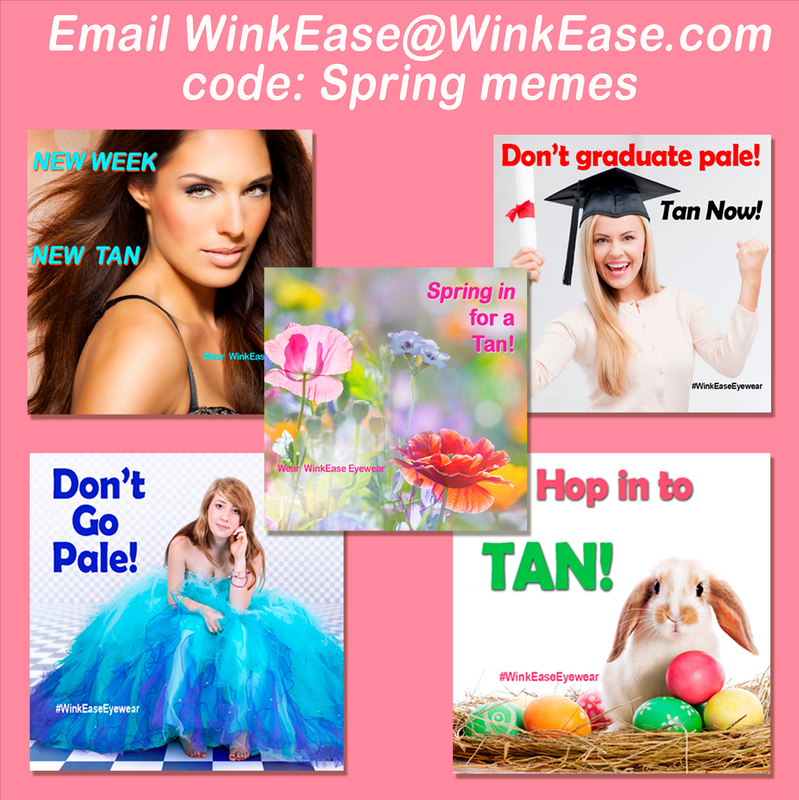 Comments Off on Use Social Media Tanning Memes to Increase Spring Sales! Click here to read more or download PDF of entire article. Comments Off on A Towel is Not Enough! Use Pinterest for Tanning Memes and More! March 2019 – EYE PRO, Inc., world leader in disposable eye protection for indoor tanning and makers of Ultra Gold WINK-EASE, Lash Room WINK-EASE and WINK-EASE Dark, loves to support salons by offering social media tips. Many salons use social media such as Facebook and Instagram to promote tanning salon products and services. “Of the myriad of social media platforms salons use, many skip Pinterest,” observes EYE PRO president Brenda Fishbaugh. “Pinterest can be used as a ‘storage locker’ for all your tanning memes. 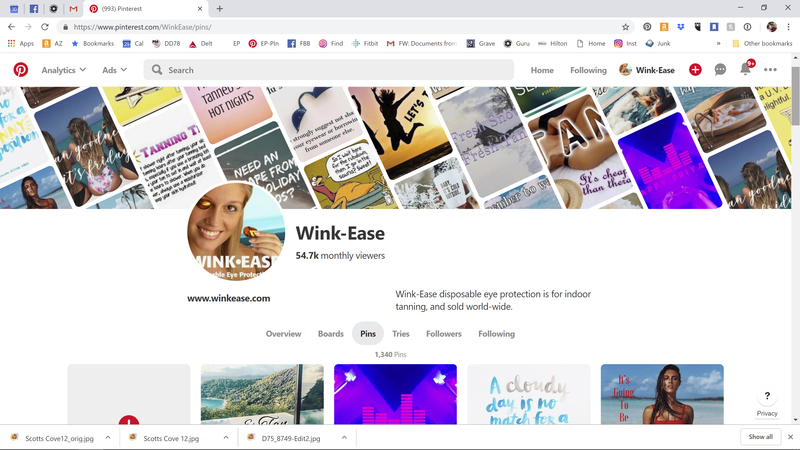 In addition to keeping your tanning posts, you can also ‘pin’ interesting items onto ‘Bulletin Boards’ that act as folders to categorize tanning articles, salon decor ideas, beach photos, local events and photos and your before/after captures,” Fishbaugh continues. Comments Off on Use Pinterest for Tanning Memes and More! Whenever I present a seminar to a group of salon operators, nearly a third of the audience tells me they provide “shared” goggles to their tanners. They say that they feel it is the key to eliminating excuses for not wearing eye protection. Why would only half of your guests use eyewear that you provide at no cost? The answer is simple. Back to my seminar: Now, I address the operators who only sell eye protection and do not loan it to tanners but require them to have their own. Some of these salons provide disposable eyewear, some include a pair of new goggles with a membership. Some merely sell eye protection, but do not provide re useable goggles. “Why do you insist that tanners have their own eyewear?” I ask this group. February 2019 – EYE PRO, Inc., world leader in disposable eye protection for indoor tanning and makers of Ultra Gold WINK-EASE, Lash Room WINK-EASE and WINK-EASE Dark, works with salons to keep clients educated about protecting their vision. 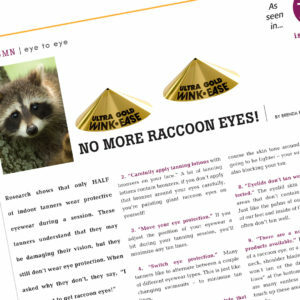 “Salons have an uphill battle in educating tanners on the importance of eye protection. Many clients won’t wear eyewear to avoid tan lines around their eyes,” says Brenda Fishbaugh, EYE PRO president. “We work with your staff to provide tips to share so tanners can avoid the dreaded ‘raccoon eyes’ and wear their eye protection every time they tan,” explains Fishbaugh, a 28-year tanning industry veteran. It’s so important for tanners to tan with a clean face, and remove all lotions and makeup, as SPF products will cause large raccoon eyes. Even men’s facial moisturizers can contain SPF and prevent their faces from tanning. “One tip we stress is to be sure to remove those products completely BEFORE you tan,” explains Jackie DeWald, EYE PRO Office Manager. “Another quick tip is to move your eye protection slightly during the session, which will diminish any possible tan line. We also like to suggest applying a dab of bronzing lotion on the eyelid and under the eye after tanning to help minimize any possible lines eye protection might leave,” enthuses DeWald. Last month, I wrote about what a state tanning inspector might look for during a visit to your salon. I was astonished to learn that in addition to state or city inspections, tanning insurance coverage now requires an inspection, as well! I asked Natalea Platt of Insurtec, a leading tanning insurance company, to walk us through what an insurance inspection might look like, and how it differs from a regulatory inspection. Comments Off on READY FOR YOUR INSURANCE INSPECTION? For Tanners, A Picture is Worth a Thousand Words! 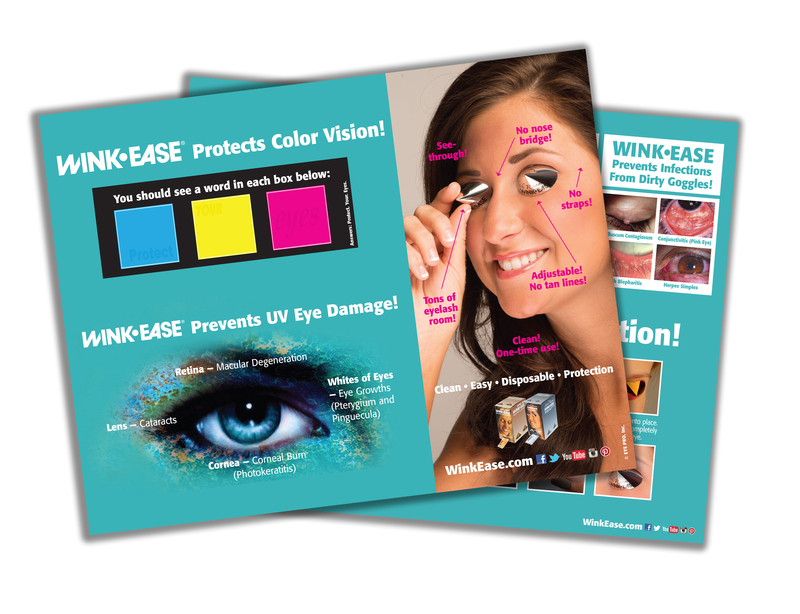 January 2018 – EYE PRO, Inc., world leader in disposable eye protection for indoor tanning and makers of Ultra Gold WINK-EASE, Lash Room WINK-EASE and WINK-EASE Dark, is offering salons an easy and effective way to help SHOW tanners why eye protection is critical. Comments Off on For Tanners, A Picture is Worth a Thousand Words! Hannig says that after she shows inspectors her well-organized three-ring binders with all her electrical and bed technical info, they always walk around the salon and poke into every nook and cranny, spending extra care in the bathroom to ensure it is sanitary. During their visit, the inspectors will not allow the salon staff to follow them. They want to see towels stored away, not out in the open where they pick up airborne contaminants. This was new to me! “They do not want to see bed-cleaning solution left in the room,” Hannig adds. “They want to see clean towels every time for wiping down each bed, so that sweat and body fluids aren’t being shared with the next tanner.” She says the inspectors want to see a log of when we made up each batch of cleaning solution. Each bed cleaner brand requires fresh solution to be mixed every 24 hours, so inspectors want to see your log and who is mixing it. “They will test it with litmus strips and expect you to have litmus strips in your mixing station,” Hannig shares. In addition, inspectors may ask to see your Standard Procedures Manual and Staff Training Manual. What are your policies for pregnant tanners, people under-18,tanners who won’t wear eyewear, and what to do in an emergency? This all needs to be in a manual for staff reference after they are trained. Comments Off on Are You Ready for an Inspection? The “Eyes” Have It at SHINE2018 in the UK! 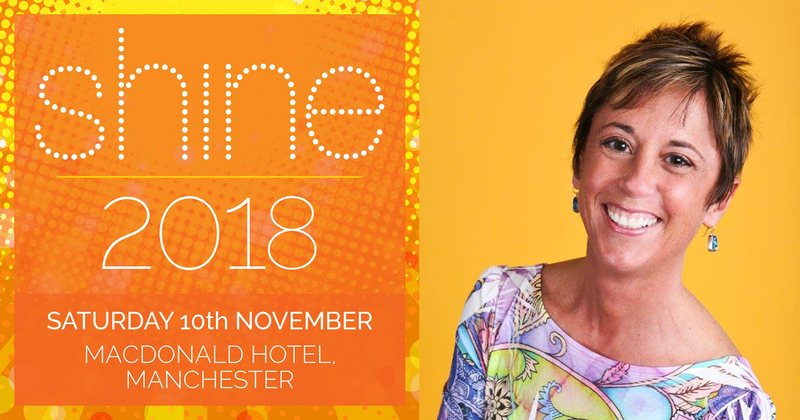 December 2018, MANCHESTER, UK – Brenda Fishbaugh, President of Eye Pro, Inc., world leader in disposable eye protection for indoor tanning and makers of Ultra Gold WINK-EASE, Lash Room WINK- EASE and WINK-EASE Dark, had the recent privilege of being the featured speaker on the importance of protective eyewear at SHINE2018 in Manchester, United Kingdom in November. Comments Off on The “Eyes” Have It at SHINE2018 in the UK! In 2005, I met Luella Gustafson, owner of salons in Iowa. She explained that she created a most unusual event to promote eye protection. I’ve shared Luella’s unorthodox idea with many salon operators, and they always applaud her creativity. Of course, I had to ask, “Why do you call it Crappy Eyewear Week and not Eyewear Awareness Week or something more tasteful?” Luella said, “Crappy Eyewear Week is FUN and we get a giggle out of everyone! We show them the really crappy eyewear in the fishbowl and we generate a lot of engagement. A woman recently brought in some goggles that her dog had chewed. Why would you put those near your eyes, with jagged edges and dog slobber on them?” Luella’s collection also includes many goggles ringed in thick mascara, white goggles that are no longer anywhere near white, and some with missing lenses and broken nose bridges. Comments Off on Crappy Eyewear Week!